Sometimes music is played at the highest performance level, and when it is, magic happens. 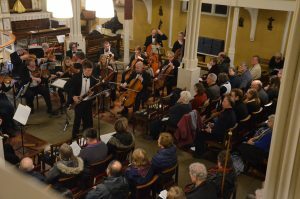 That’s just how it felt at the wonderful Arco strings concert at SMSG on Saturday night, 25 November 2017. 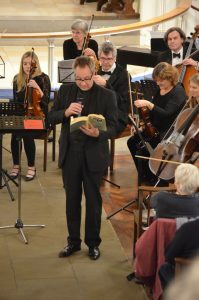 The programme, skilfully chosen by conductor David Knight, included works by Mozart, Vivaldi, Albinoni and Schoenberg. 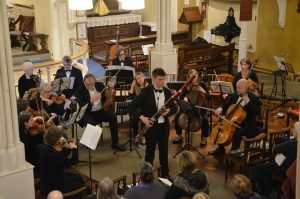 And topping the bill was the first performance of a Concerto for Bassoon and Strings by Arco Strings’ Composer in Residence, Arturo Cuellar. 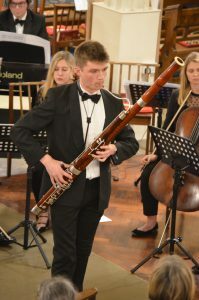 In the Cuellar and the Vivaldi bassoon concertos, William Gough, a fabulously talented young local musician, proved why without doubt he is destined to be a great musical star. With poise and certainty, and effortless technique, he led Arco strings in a liquid performance of the Vivaldi concerto. In the slow movement, the rapport between soloist and cello continuo was glorious. In Cuellar’s concerto, with its pulsating South American rhythms and spiky harmonies, William Gough shone through, persuading everyone of his terrific musicianship. 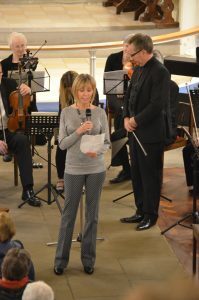 The performance of Albinoni’s Adagio was a tribute to the hard years of fundraising from everyone at Music for All at SMSG. 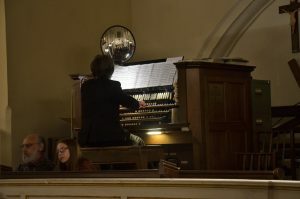 Here we heard a beautiful, famous piece, that requires a sensitive organ accompaniment. And because the Willis organ is now at ‘concert pitch’ this fantastic combination of strings and organ can now be heard here in Stony. What a beautiful performance it was. After the interval, David Knight conducted Arco Strings in Schoenberg’s rhapsodic Verklärte Nacht with deep warmth and great commitment. His introduction to the work, which included words from Schoenberg’s own writings, helped make even more sense of the music. The poem on which Schoenberg based the music is based was read to us before the performance. This too helped explain the romantic lyricism that makes this music so astonishingly beautiful. Schoenberg’s music had been booed by the audience at first hearing (and rejected by music judges at the time). To modern ears this criticism makes no sense at all: we hear it now as one of the most emotionally satisfying romantic works in the repertoire. 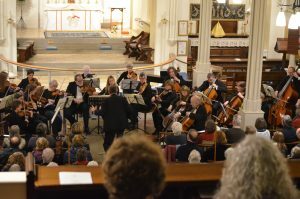 Arco Strings’ luminous performance brought out the extraordinary range of radiant sounds that only a very high quality string orchestra can produce. It was a performance of great beauty. The concert was sheer magic. I for one can’t wait for their next concert.